Members of the Class of 2016-17 will hear about a worldwide food-safety initiative with roots in Hancock County as part of Business/Commerce/Ag Day on Nov. 2. The schedule/agenda for Business Day has been finalized. You can look at it by clicking on the link below. Mitch Davis, an Elanco Animal Health executive who helped organize a recent summit in Washington D.C., to talk about the use of antibiotics in animals in the food production chain, will talk about the Greenfield-based company’s role in the One Health initiative, which is trying to address the stewardship of antibiotics use around the world. This is the second class day for the Class of 2016-17. The next class will be Dec. 7: Community Issues Day. On that day, the class, which has 25 members, will be divided into groups that will receive assignments for community projects. The projects will be presented at LHC’s graduation next spring. Speakers who will address the class on Business/Commerce/Ag Day include (from left) Mitch Davis of Elanco; Retta Livengood of the Greenfield Area Chamber of Commerce; Roy Ballard of Purdue Extension Hancock County; and Skip Kuker; executive director of the Hancock Economic Development Council. After a whirlwind tour of Hancock County historical sites on Oct. 5, the Class of 2016-17 is now looking forward to its next class day on Nov. 2. That day is Business/Commerce/Agriculture Day, and class members will learn a lot about Hancock County’s workplace diversity in a series of talks and visits. The day will begin at Elanco Animal Health, arguably Hancock County’s most important employer. The class will hear from Mitch Davis, the director of Global Shared Value at Elanco; Retta Livengood, president of the Greenfield Area Chamber of Commerce; Roy Ballard, an agriculture expert with Purdue Extension Hancock County; and Skip Kuker, executive director of the Hancock Economic Development Council. Later in the day, the group will travel to Fortville for a tour at Fortville Feeders, a national leader in vibratory bowl feeder technology. According to Wikipedia, these machines are “common devices used to feed individual component parts for assembly on industrial production lines.” They are an obscure but vitally important part of any assembly operation. Imagine how a million caps work their way onto shampoo bottles whizzing by on a conveyor, and you get the idea. The group will end the day at Wooden Bear Brewing, a popular craft beer brewery that is enjoying a successful start-up in Greenfield. The Business Day itinerary is nearly as packed as the one for History Day on Oct. 5. The class visited six historic sites that day: the Old Log Jail and Chapel in the Park museums; the James Whitcomb Riley Home; Tuttle Orchards; the Thomas Log Cabin; and the Octagon House in Shirley. 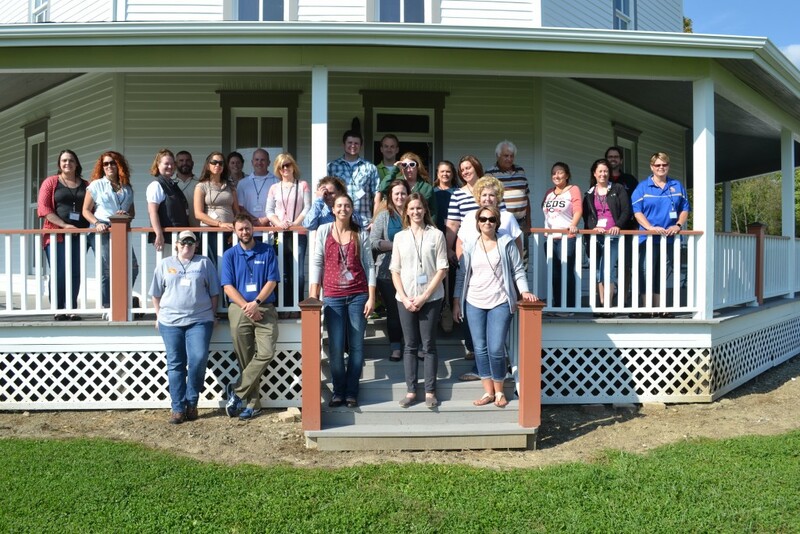 Members of the Class of 2016-17 pose for a photo outside the Octagon House in Shirley. The group stopped at the historic site on History Day Oct. 5.